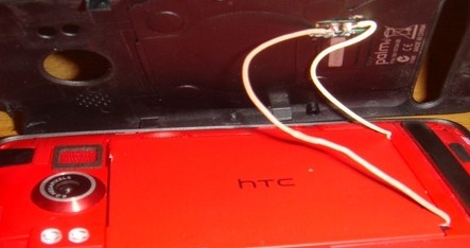 [Danny] added wireless charging to his HTC Evo. The hard work was already done for him by Palm, it was just a matter of adding that hardware to his phone. A Touchstone induction charging kit for the Palm Pre will cost you just over $40 for the base station and a replacement back cover. [Danny’s] method removes the induction coil from that cover a relocates inside the case of the Evo. He routes two wires around the battery and solders them to positive and ground connections on the board. Once it’s back together the device draws power without any wires.